Following up on this post about cryptids, here are some semi-random thoughts about how speculative paleontology could flesh out some of the creatures of myth and folklore. In particular, here are some possible connections that I kind of love. Creodonts share a common ancestor with members of the order Carnivora. They bear a superficial similarity to large cats or enormous weasels, but are actually quite distinct. I’m thinking the claims about various large Appalachian predators known as the glawackus, the Ozark howler, and the Beast of Bladenboro might fit the bill as contemporary members of this extinct order of mammals. All three of these cryptids are described as being vaguely feline, but not quite. The glawackus, for example, is described as combining the most fearsome characteristics of a lion, a panther, and a bear. The Ozark howler is bear-sized, but seems mostly to resemble a shaggy feline creature. The Beast of Bladenboro seems to combine features of both cats and dogs. All of this suggests some member of the order Creodonta. Perhaps they would be of the family Oxyaenidae, cat-like beasts that walked on flat feet like a bear. They had a short, broad skull, deep jaws, and teeth designed for crushing rather than shearing. A further possible creodont is the water panther of Algonquian legend. 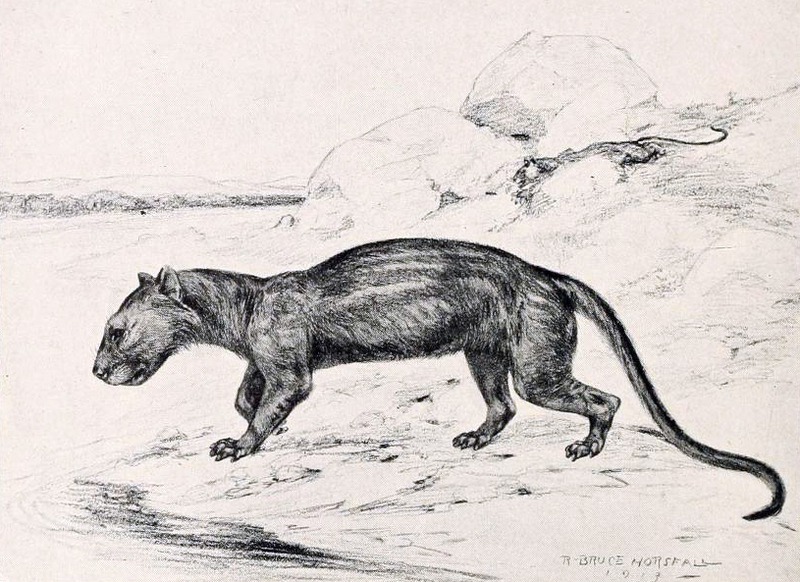 This creature might be a member of genus Patriofelis, which was about the same size as a panther and thought to be a good swimmer but a poor runner. This Pleistocene predator, Arctodus simus, was possibly the largest carnivorous land mammal that ever lived in North America. These enormous predators might give us a template for the “man-eater,” “naked bear,” or “stiff-legged bear” of many Native American mythologies. This creature was apparently a gigantic, stiff-legged and hairless beast as big as an elephant. Some even speculate that legends of the man-eater represent the dim memory of mammoths and mastodons that once roamed North America. But there are a number of arguments against this theory. 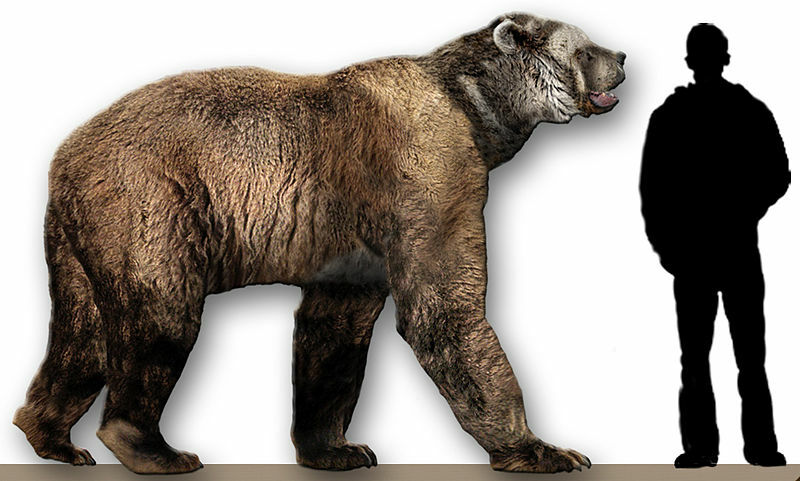 First, the creature is described as being a gigantic bear—a creature that Native Americans would have known quite well. Second, as the name might suggest, the man-eater is a carnivore, while mammoths and mastodons were herbivores. Finally, man-eaters are never mentioned as having a trunk. This one is actually fairly commonplace. Among those who believe creatures like the yeti or sasquatch are real, many assert that they are, in fact, gigantopithecines. Gigantopithecus blacki was the largest primate that ever lived, reaching almost ten feet in height if it stood upright. Paleontologists are actually fairly certain this enormous creature walked on all fours like a gorilla, but a minority view holds that they were bipedal. 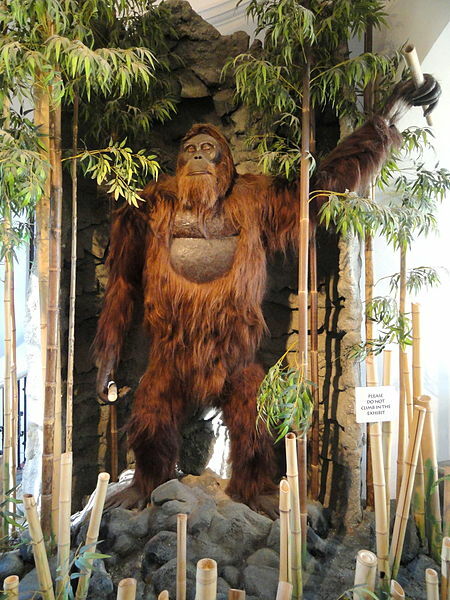 Members of genus Gigantopithecus are pongines, meaning they are close relatives of the orangutan. Darren Naish follows this same reasoning in the Cryptozoologicon, explaining that the yeti or sasquatch is a bipedal pongine, “convergently similar to hominins in some ways but different with respect to the details of anatomy, gait and behaviour.” In most legends, sasquatch (by whatever name) are incapable of human speech and communicate, rather, by means of whistles, grunts, and gestures. Depending on what you imagine as far as a sasquatch’s intelligence or behavior, one might also suggest it is more closely related to humans. Several Native American legends have a bigfoot-like creature that is described as an ogre, perhaps an over-large descendant of Paranthropus boisei or something similar. In some legends, sasquatch are able to mate with human women. This would not be genetically possible by either of these theories, however, barring some sort of magical intervention. Members of the genus Elasmotherium are close relatives of the rhinoceros, as evidenced by the prominent horn of keratin protruding from their forehead. They are also fairly closely related to horses and tapirs as members of the order Perissodactyla. A conjectural “pygmy” elasmothere might be a Clydesdale-sized creature adapted for fast running on open grassland. With longer legs than rhinos, they would have a galloping, horse-like gait. 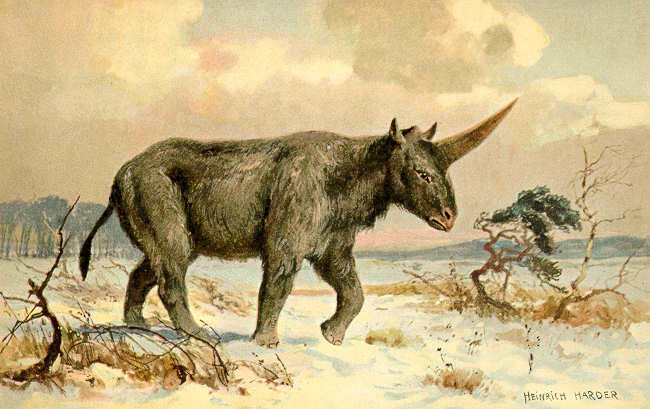 Of course, I am describing a unicorn—or at least something very similar to the unicorns first described by Ctesias and Pliny in ancient times. Such creatures would have hooved toes, four on their forelegs and three on their hindlegs, precisely as some medieval sources describe. Behaviorally, they might well be every bit as irascible as their rhinoceros cousins, also in keeping with the earliest strands of unicorn-lore. Giraffids are a family of even-toed ungulates. Today they are represented solely by giraffes and okapis. In prehistoric times, however, they were much more diverse. I suspect one or another genus of prehistoric giraffids might make a fine template by which to understand the qilin or “Chinese unicorn“—which isn’t properly a unicorn at all as it is usually depicted with two horns. 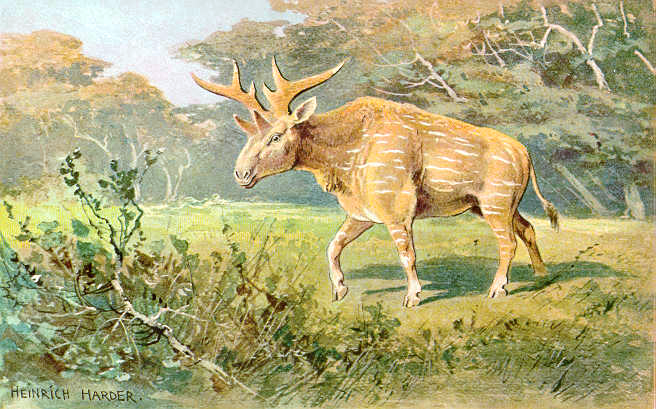 Perhaps something like Shansitherium fuguensis would fit the bill. Giraffids are ruminants closely related to cattle and deer. Their horns, called ossicones, are covered in skin. Like the ossicones of giraffes, those of the qilin are reported to be blunt rather than sharp, which has been taken as an indication of the animal’s peaceful nature. A tesselated coat pattern like a giraffe’s might give the impression that the creature has scales on its back. Like the okapi (and unlike giraffes), the qilin is apparently a solidary creature. In Asian art, qilin show great variety in physical appearance. All qilin have a deer-like body and cloven hooves. Japanese, Korean, and the earliest Chinese depictions agree that the qilin bears at least a superficial resemblance to a deer. This entry was posted in Mythology and tagged Beast of Bladenboro, Creodont, Elasmotherium, Gigantopithecus, Giraffid, Glawackus, Man-eater, Ozark Howler, Qilin, Sasquatch, Short-faced Bear, Stiff-legged Bear, Unicorn, Water Panther, Yeti. Bookmark the permalink.